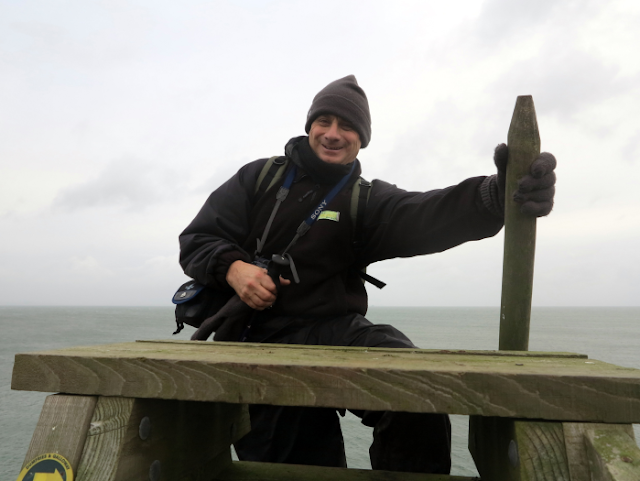 The day for the last walk of the year dawned clear and dry, although very windy on the Mull of Galloway, where the last piece of the coast path was to be slotted into place. 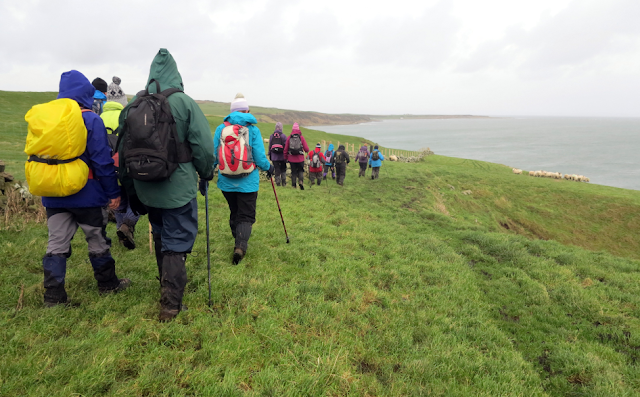 The east side of the Mull was quite sheltered and the wind was behind the walkers for much of the way, as they walked northwards. 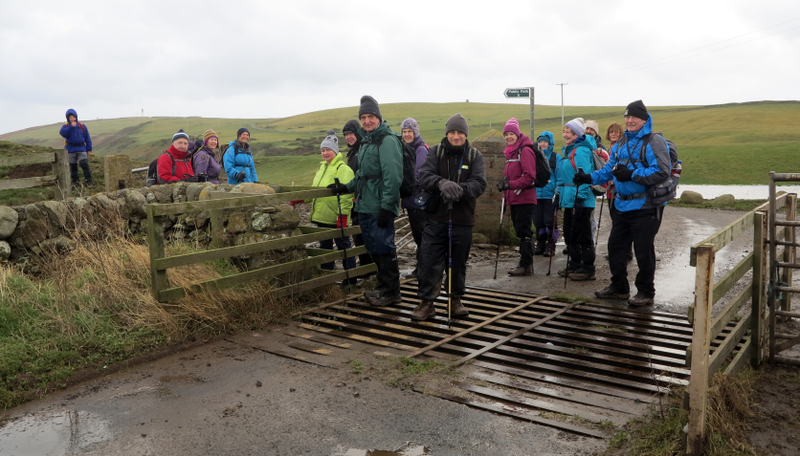 Sixteen ramblers felt in need of exercise after Christmas indulgence and were well wrapped up to cope with the mud - the result of the last few weeks of rain. Isobel collected me from home and took me to Cairngaan to join Cath, our leader, Rachel who was back up, Thomas, Clare, Jim and Peter. Our numbers swelled from 8 to 16 after two more cars arrived just after 10am. Carl, Duncan, Irene, Mary x 2, Leslie, Christine and ‘two poles’ John joined us as we left Cairngaan and headed southwards. From West Cairngaan the way took the farm lane and then a well-made track over to the Mull road, where tarmac ensured a little cleaner surface until East Tarbet was reached. The road was empty, a ferry was being tossed in the distance, and the lighthouse stood in solitude high to the south, the wind scraping the ground free of debris. With thankfulness the party turned north in the lee of the fields, looking over Luce Bay along the coast path. Stopping to read one of the notice boards, provided by the local Rotary club who had worked hard to make up the coast path, the ramblers learnt the story of St. Medan who for a time is said to have inhabited a cave below the cliffs here, to escape from a persistent paramour. When he eventually caught up with her and remarked on her lovely eyes, she plucked them out and threw them at his feet, escaping by floating on a boulder across Luce Bay to Kirkmaiden, near Monreith, where she miraculously had her sight restored by the healing waters found there. 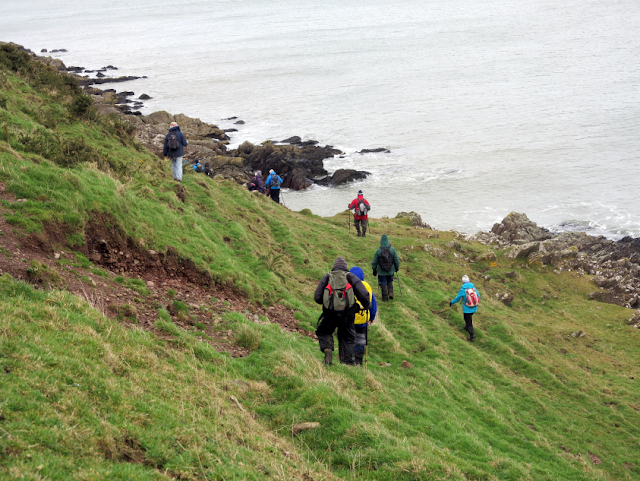 Not one of the ramblers wanted to descend the cliffs to inspect the cave below. We disturbed a flock of sheep as we made our way along the grassy stretch above the rocks with their many shapes and contours – the result of disruption 40 million years ago when the horizontal layering was pushed upwards. 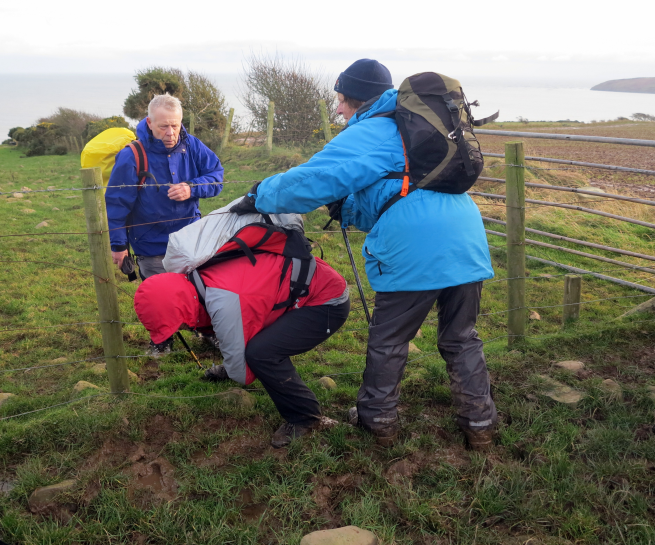 A ladder stile took the company into a field for a few yards before descending lower and walking the rocky foreshore accompanied by the roaring incoming tide. 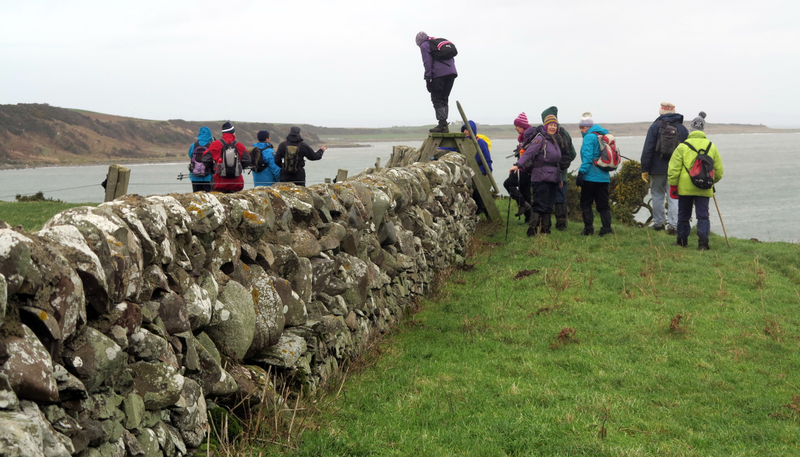 A hare ran by the walkers and a seal bobbed in the water below, curiously watching as they passed. 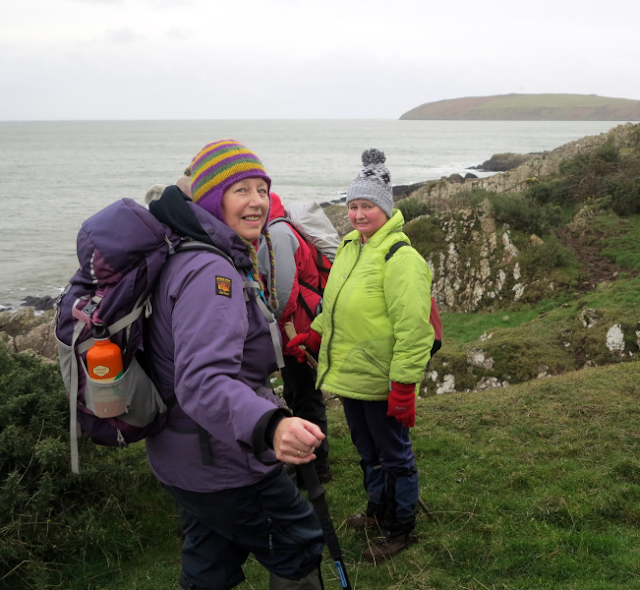 Short areas of grass covered rocks were followed by narrow muddy tracks through gorse bushes until we reached Portankill. The kirk burn was crossed, where a peculiarity of the pebbly beach means that the burn disappears below the surface for some feet before reappearing to enter the sea - this ensured dry feet for most, as the cliffs were climbed once more, gaining a slippery and muddy path alongside a fence. 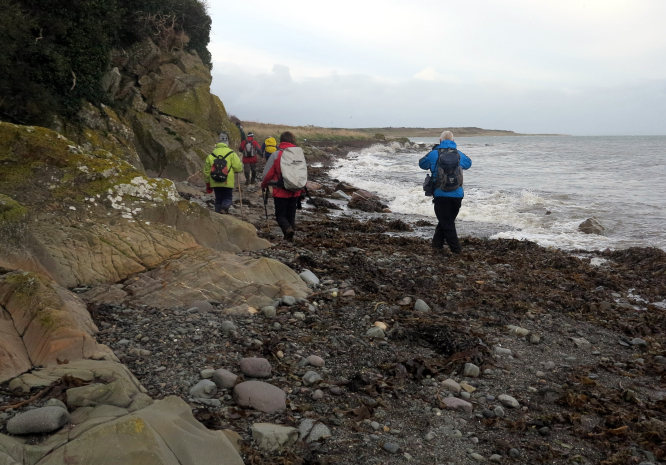 After descending once again past Marion’s Isle – a higher piece of land out to sea, which is usually covered by the tide - the beach was walked, and Carrickcundie passed. 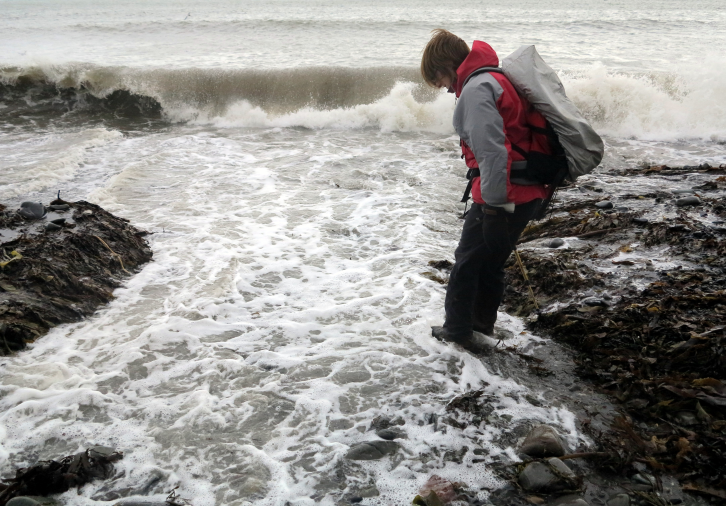 The tide here was almost to the base of this rocky outcrop, the pebbles slippery and covered with banks of seaweed brought up by the rough weather. 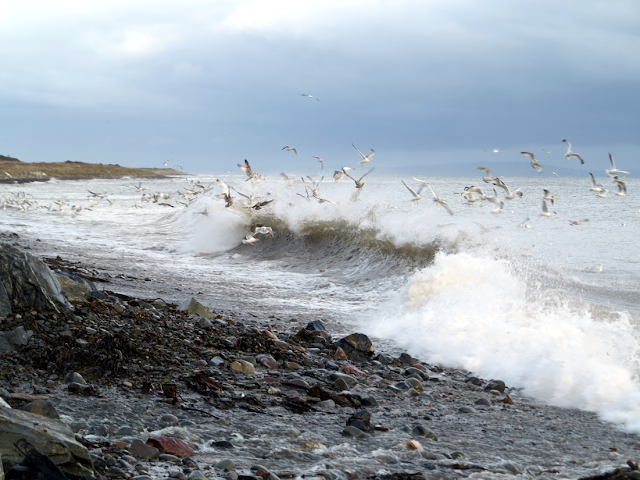 The lunch spot was now in sight, a boulder embankment in front of Maryport Caravan site where the seaweed had brought scores of gulls to feed on the rich pickings of the tide line. 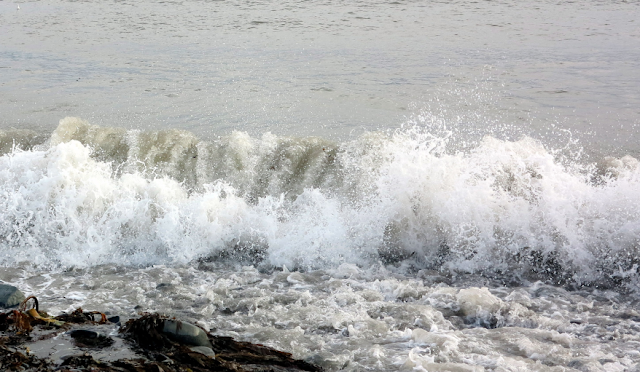 They rode the waves and rose in banks as the sea crashed against the shore. This was a highlight of the walk, so many birds around, that the rest of the countryside must have been denuded of their presence. The tide became higher splashing at the feet of the picnickers, carrying the pebbles forward as the water surged and then dragging them back rattling against each other as they went. 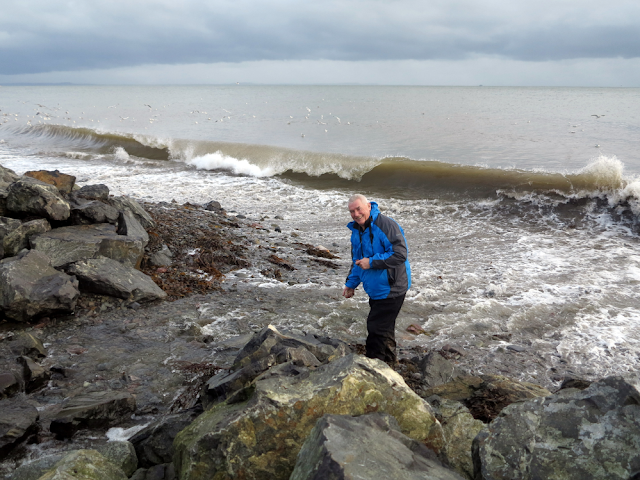 Jim was searching for something on the beach close by and just about managed to dodge some of the incoming foamy water as had Rachel earlier. Cameras were recording this excitement with still and video photography by the usual offenders! It was with reluctance that the walkers continued on their way steeply up through Creechan farmyard and once more on to a farm track which led through fields, high above the cliffs already walked and giving wonderful views backwards to the benign countryside with its rolling pastures, around Drummore, backed by a sea sparkling and dotted with white horses. The sun even made an appearance for this stretch of the day. The Mull road was crossed to walk the woods of Cairngaan, still muddy but nicely sheltered back to the farm lane where the walk had begun. Tea was served in the farmhouse, a very sociable end to the walks of 2012. 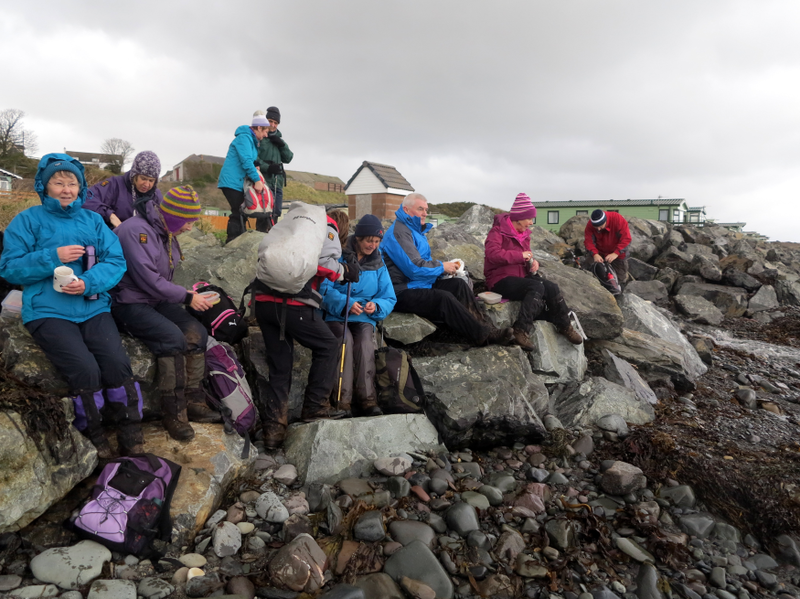 Cath provided us with sumptuous cakes and scones, her large farmhouse table groaning under the weight of the edible hospitality, soon followed by groaning chairs after 16 of us had tried to do justice to the wonderful baking provided by our hostess. If she entered the Great British Bakeoff the other contestants would have NO chance! Very many thanks Cath for a brilliant walk and for your usual warm welcome!